The earnings for a hustler can vary because not every offer is risk free or guaranteed profit, however you can aim for £500 to £1,000. Don't worry though, as a hustler you will be doing ALL worthwhile offers, which includes the guaranteed £300 a month that Team Regulars are doing! The more time you put into being a hustler, the more you will get out of it. You could spend just an hour or so a day and still make a decent profit each month, but to make the serious money you should be spending a couple of hours a day (maybe an hour in the morning, on your lunch break, or when you get in from work). It also helps to plan when you’re around for offers - for example being free on Saturday afternoons for the ITV Horse Racing, and being free Tuesday/Wednesday nights for the Champions League when it’s on. If you’re looking to earn £500 or more a month then I’d recommend starting with at least £1000. Some of the offers don’t require much money at all, but with so many going on at the same time it’s easier to have more money instead of missing offers because of having to wait for withdrawals. Also some of the higher value offers require large stakes in the region of £100 or £200, so you would also need enough in the exchange to lay these off. Technically there is no cap on how much you can make, as offers such as Bet365 and Paddypower 2up have no maximum stake. However realistically you should be looking to make at least £500 or even £1000 with a starting bank of around £1000. If you can get on the horses every day and be around at the weekends for football offers then you should be able to make up to £1000. Is it sustainable? Can I go full time? It’s no secret that people are Matched Betting full time and making a successful income from it, but with that comes a lot of risk. The main one is in the form of gubbings. If you’re Matched Betting full time and you get gubbed from a bookie you make a lot off, you’re basically taking a huge pay cut. For this reason we wouldn’t advise anyone going full time at all, and would just recommend that you treat it as a side income. It is sustainable up to a certain point, but your accounts won’t last forever! What support can I receive if I need help? Despite being a free service we will always do our very best to help you! You can contact us at Team Profit for anything (Matched Betting or not!). You can aim to make £500 to £1,000 profit every month from guaranteed profit and low risk offers listed below. Some of the offers towards the end aren't guaranteed profit offers, but as a Hustler you will be making money in the long term because the odds are in your favour. *please note we haven't calculated Bet365 or PaddyPower 2up. This is an unlimited offer, and with stakes of £200-£300 you could well earn up to £500 a month alone from that offer. *Again this depends on how much you're hitting it. If you're doing William Hill high 5 for example, you may hit a refund every other day therefore making around £50 profit every 2 days. Bet365 lock ins are worth around £20 every Saturday and but not advisable to do midweek. *This is just for the low risk and risk-free offers. You can make more in the long run doing high risk offers (but they are exactly the - high risk!). If you try to read all the guides in one go, there is a high chance your brain may explode - not good! Instead, we recommend reading the Free Bet Clubs guides first and then profiting from these Free Bet Clubs before moving on to the next offer, Price Boosts. This may take days or even weeks to learn all 8 offers but you will find this more comfortable and enjoyable! Check out Tom's Top Tips for Hustlers guide! This contains plenty of helpful tips to ensure you make the most of matched betting. Matched betting is more fun and profitable when you're completing offers alongside fellow matched betters. Check out the Team Profit Facebook Group and say hello to your fellow Team Hustler buddies! 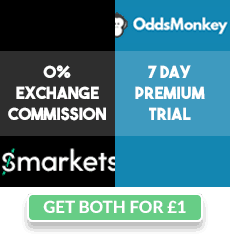 Needed: For these daily offers you need to be using Oddsmonkey's tools, alongside their Smarkets 0% offer!